My son is 3.5 years old, and like many kids his age he has a lot of fear. When you are two feet tall a world built for adults is very intimidating. Like my son, I have my own fears as well, and one of those is horrible fear of heights, as my wife can attest to when we tried to climb the “church tower” at Holy Hill (which I did make to the top but only because I wasn’t able to turn around). This weekend we went to the Milwaukee Wi zoo to celebrate my sister-in-law’s birthday. 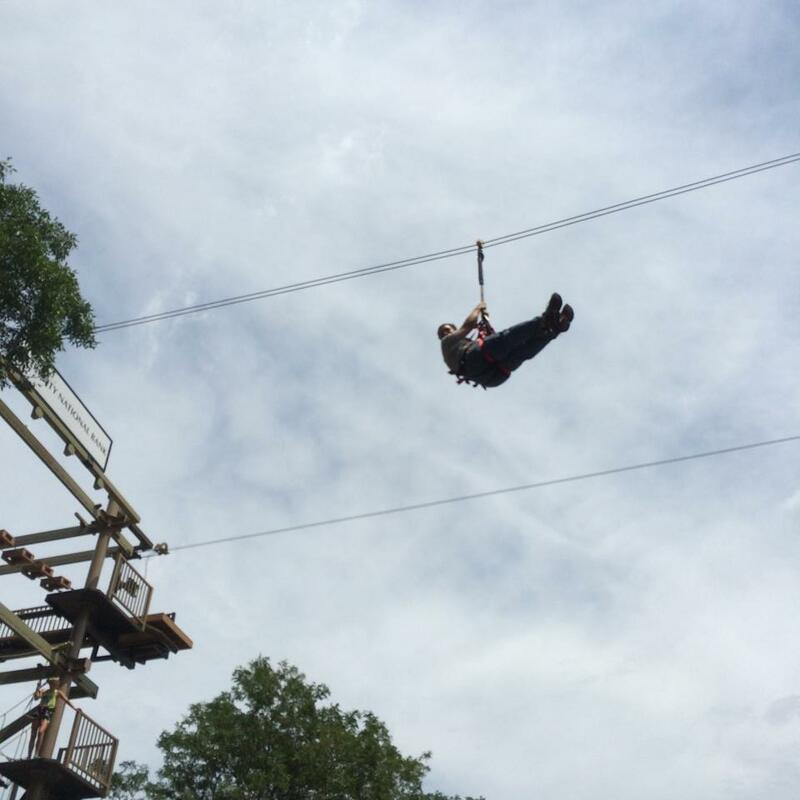 They have a high ropes course and small zip-line and I thought it might be a nice challenge for me to attempt. I spoke with my wife, and she gave me the thumbs up, so first thing I do is check for the weight limit. I had a knot in my stomach as I walked up to the signage. I often don’t wear my glasses so I could just make out “weight limit” but couldn’t read the rest. I almost didn’t bother to look further, but I did and it said the weight limit was 300 pounds. Great; I can actually do it, but not right now, first we have a little boy who want to go see some animals. 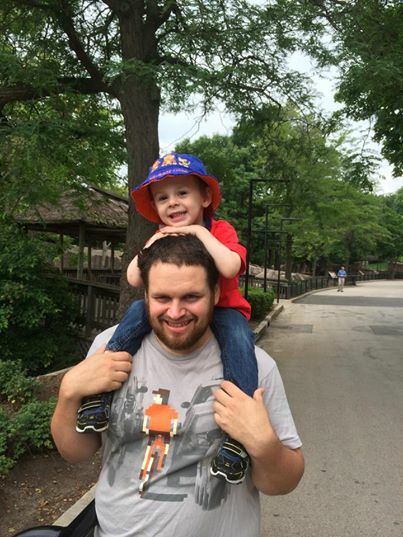 We went and looked at the Big Cats, since my son loves all the lions, tiger, cheetahs, and so on. 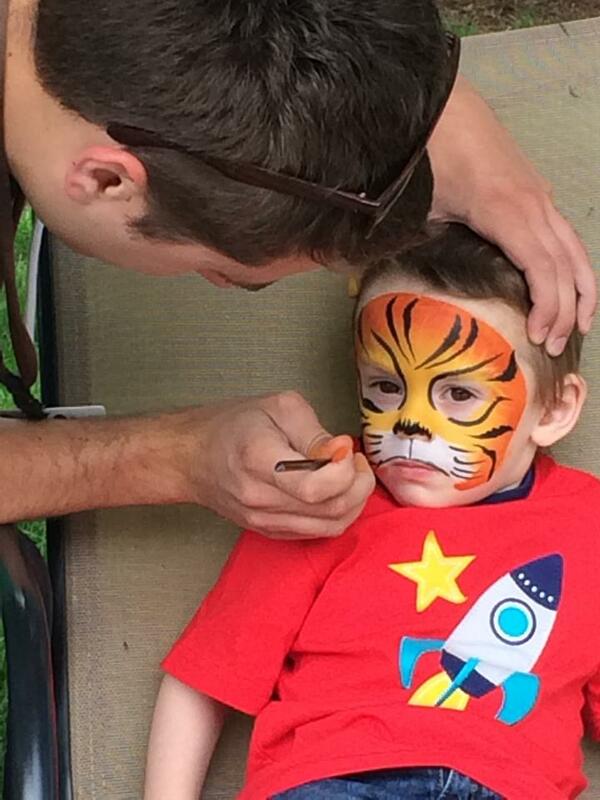 After that we came across a face painting kiosk and my son who is scared of everything decided he wants to be a tiger. Getting his “tiger face” on at the zoo. He didn’t want to be a scary tiger though, he is Daniel Tiger (based on Mr. Rogers neighborhood, it is a great new PBS show that I highly recommend). With tiger face on, it was time to go ride the Camels. 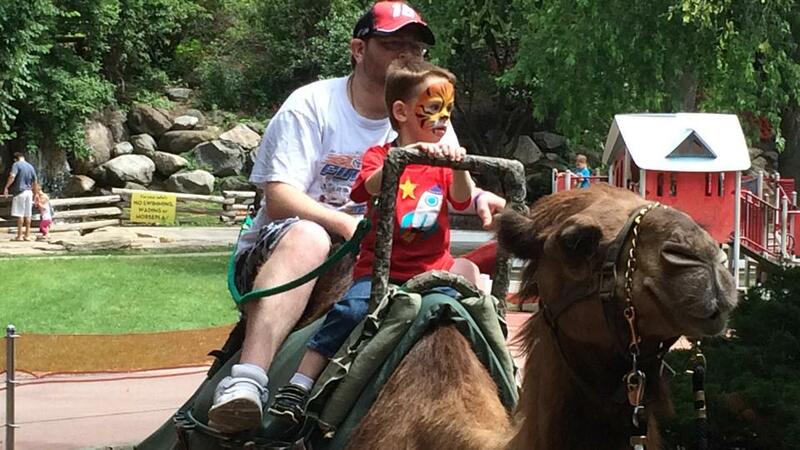 Although I didn’t ride the camel, my brother-in-law wanted to take my son on the ride with him. Approaching the deck my son starts to freak out; he is too scared to ride the camel. This part may make me seem like a horrible parent, I am sure I might get a nasty comment or two even, but I made him ride that camel. I didn’t just plop him on the beast, I picked him up and talked with him. I made sure that the reason he didn’t want to go on was his fear. When he said it was, I talked about facing our fears, but just got a blank look back. I put him on the camel; he went for a ride and had a good time. Will the rope really hold me? What if I slip, will everyone laugh at me? What if they didn’t tighten the harness right? I know it “says” 300 pounds, but what if it really is 200 pounds? Will I end up as some fat-man MEME on the internet? Do I want to spend the money and chicken out part way? What if I fall down and squish someone? Perhaps my pants might rip? Will people laugh at me? Will I piss my pants? Plenty of fun things to worry about right? A song lyric has been going through my head a lot lately “life’s for the living, so live it, or your better off dead.” I wrote a post on my birthday about learning to live my life to the fullest and not let me weight keep me from doing things. Does it also extend though to my fears? I wasn’t sure what to do but I had to make a choice; walk away, no better off than I was, or to face the fear and “grow.” What would you do? What have you done? I wish I could tell you that I was able to do the course, to look fear in the eye and laugh. I wish I could tell you that I hooked up to that zip line and flew like a bird through the air. But I will let the picture do that for me. I did the first level, and I did the second, I crossed a couple of beams, a rope bridge with the wood pieces at angles, wood “boxes” with variations of the same. I knew that if I was going to do this, I need to do it right. I spotted a tight rope and knew I needed to do it. It had some cords hanging above to grab as you move along, which I did use. As I reached for one about half way across I looked down. I froze, I couldn’t move. WHY AM I STANDING ON A BIT OF TWINE 1,000,000,000,000 FEET IN THE AIR? I took a deep breath, I closed my eyes, I opened them, and I was still standing on a bit of twine, a trillion feet in the air. Something was different though, I was calm, and I looked down and shrugged and kept going. I made it across, alive, rejuvenated and most importantly dry. I didn’t stop there I crossed the majority of the challenges, and the only ones I skipped were simply based on time. I spat in fear’s face, but my adventure wasn’t over yet. I had to go to the very bottom to get hooked up for the zip line. They asked me how I liked the course, I said it was scary but I enjoyed it. Once my lines were switched I went back up to the top (they had a direct staircase to get there), and I looked out over the tree line to the other tower. 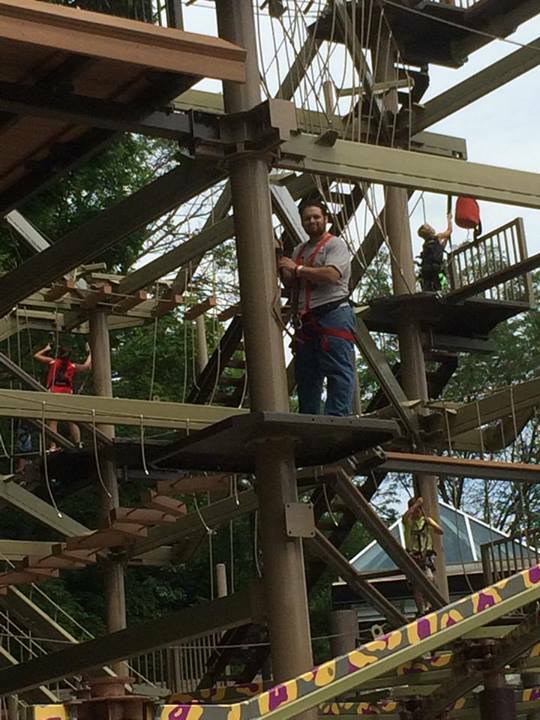 I felt confident, I just did this ropes course, so this would be easy, not like I was jumping off the ground… crap. That tower across from me jumped 30 miles away, and 1000 feet in the air. I have never felt myself in a state of such Zen like peacefulness, the world zipped below me, and I felt alive. I was a bird, I was the wind, and I was at peace. Though it was only moments, it felt like an hour, I reached the other side, were the first thing they ask me was how was it? How was it? I just touched the wind, I became one with the soul of the earth, and I stayed dry. “It was pretty neat” was my response. I got to go across one more time, and the same euphoric feeling greeted me. I quickly headed down to meet back up with everyone and go enjoy more things. When I get down, everyone was about ready to go but I needed to take my son to use the potty (you’ve got to love potty training). On the way my son tells me about how he didn’t want me to go on the course; it was scary and I shouldn’t do it. I picked him up (brave when you are on your way to the potty), and talked to him. Me: It was very scary. I get scared of being high up. Son: When you looked down? Me: When I looked down I was even more afraid. Want to know a secret? Me; Sorta, you look at that fear, whatever it is, and you laugh. You say HAHAHA fear, you can’t stop me. Me: Nothing can be scary if you find it funny. Say it with me HAHAHA fear you can’t stop me. Son: HAHA FEAR. YOU CANT STOP ME. Me: The second part is you just do it. You say haha, and just do it. He is still scared of things, but I am hoping with time he can overcome it. I have learned the hard way that fear can keep you from enjoying life. I still am deathly afraid of heights, but I know I can just laugh at it, and anything that is funny can’t be scary. You have to feel sooo good for your accomplishments!!!! Your weight loss is super!!! What an example you are for your children!!! You are a super Dad!!! I really loved this post. Thank you for sharing your fears. What a great example of facing your fears, even though it can be so scary! Nice moment – parenting and otherwise. Glad you pushed past the fear and enjoyed yourself (at least somewhat). Hopefully, this will encourage your son to overcome fears he may have. 10 things every cyclist should carry! Life is a messy, muddy, and bumpy road. Suicide Prevention. Support for Depression and Grief. Encouragement for Everyone.